The global cooling tower market is experiencing a transformational shift in dynamics in the recent times owing to an increase in investments toward industrial sector development, along with the ongoing addition of thermal power plants. Further, the prevailing adoption of sustainable energy sources, as well as the cogeneration technologies driven by a rise in consumer awareness would augment the business growth in the years to come. 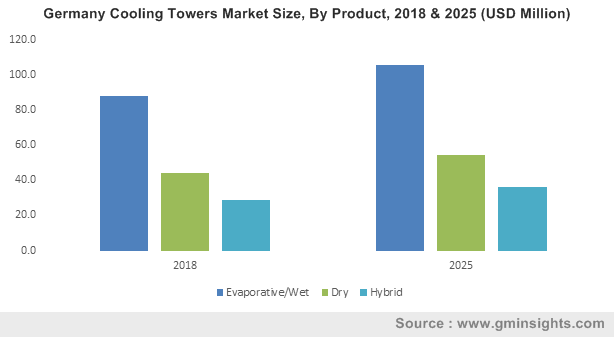 Favorable regulatory policies toward sustainable power generation coupled with robust growth in the manufacturing sector will foster an increase in the product adoption, which would result in the growth of cooling tower market in the years to come. Fundamental changes in the government policies are redefining the manufacturing sector in recent times. An acceleration in investment towards the oil & gas sector, mainly across Asia Pacific & Middle East region, has also been observed. For example, Reliance announced the expansion of its Jamnagar refinery, in Sept. 2017, by adding a refining capacity of 30 million tons per annum. These investments, in tandem with the ongoing expansion and development of new oil refineries will impel cooling tower industry share in the years to come. The O&G industry is anticipated to be a viable revenue stream for cooling tower market, given the product demand across refineries. The robust expansion of refineries worldwide and the developments prevalent in the oil exploration sector will thus prove to me a major growth impetus for this industry, specifically across the APAC. Recently, the China-based Zhoushan refinery complex, an upcoming large-scale downstream project for 2019, controlled by Zhejiang Petroleum and Chemical Company, made it to the headlines for announcing that it anticipates to commence its production activities by the third quarter of 2019. When completed, this complex would have a refining capacity of 800,000b/d, and is being constructed in two phases. The world’s leading LNG producer Qatar is also seeking to grow its production by 30% by 2024. By the end of September 2018, the country had planned to expand its current capacity through the provision of four new LNG trains, which would boost the production from the current 77 mtpa to 110 mtpa. The extensive developments prevailing in the global oil and gas industry would thus majorly drive the growth of cooling tower market from O&G applications. The chemicals sector is bound to come up as a prime application avenue for cooling tower market. The product, on account of its ability to reduce energy consumption cost, noise emissions, and maintenance costs, is extensively deployed across heavy chemical manufacturing and fertilizer plants. Given the massive demand for chemicals across a slew of domains, the global chemical sector is slated to depict an exponential rise in terms of revenue in the years ahead. Quite overtly, this would transform the commercialization graph of the global cooling tower industry from chemical and fertilizer applications. The Indian Prime Minister Narendra Modi has recently approved the commencement of an Odisha-based fertilizer plant, Talcher Fertilizers Ltd., a joint venture between state run Coal India Ltd. (CIL), Rashtriya Chemicals & Fertilizers Ltd. (RCF) and GAIL (India) Ltd. Once Talcher Fertilizers is commissioned, the plant is expected to produce about 1.26 million metric tons of neem coated urea per year, that would help step up urea production. As per government estimates, urea production capacity of the country is predicted to rise to 34 million tons by 2021 or 2022, compared to the current 25 million tons. The increasing production of fertilizers around the world will thus push the demand for better manufacturing plants, impelling cooling tower market size. With sustainable electricity generation becoming a mantra for the future, the demand for the establishment of power plants is certain to augment cooling tower industry share. The ability of cooling towers to minimize energy loss and lower energy consumption is certain to fuel cooling tower market from power generation applications. Another factor that would extensively propel cooling tower market share from power generation is the robust increase in the number of sustainable power plants across the globe. The Vietnam based TTC Group has recently initiated the largest solar power plant in the country. The 49MW TTC Krông Pa solar power plant, with an investment of $60 million, is built on area of 70.2 hectare in Ch? Gu Commune. The plant was put into operation after nine months of construction and is estimated to supply a capacity of 103 million kWh per annum to the national electricity system. Furthermore, U.K. based Enterprize Energy has revealed a plan of building a wind farm of 3.4GW capacity in the Vietnamese waters. This project, known as Ke Ga, would require a total investment of $12 billion, and is set to be built in up-to-600MW phases. The growing investments in power generation would thus escalate the growth of cooling tower market in the forthcoming years. Powered by an extensive application spectrum, it comes as no surprise that the cooling tower market is touted to garner renewed traction in the years ahead. For the record, the cooling tower market size is estimated to cross a valuation of US$3 billion by the end of 2025.